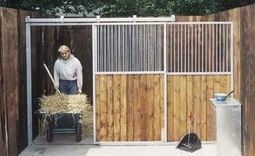 Our strong one piece metal galvanized panels are perfect for converting a barn into separate stables. 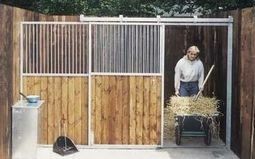 Partitions allow horses to see each other and what is going on around to alleviate boredom. 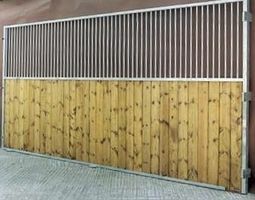 Our beautiful v-jointed redwood tongue and groove boards are ready fitted to enable a rapid installation. Construction 125mm x 36mm planed, jointed tongue in groove redwood board, 1295mm high 45mm U-channel bottom/mid rail. 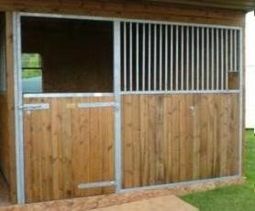 External frame of 40mm and door post of 80mm 22mm vertical steel bars spaced at 56mm apart. 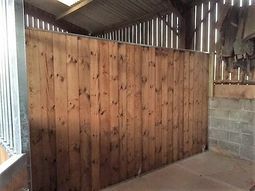 Sizes 2.1m high (82 3/4") x 3.66m wide (12'). 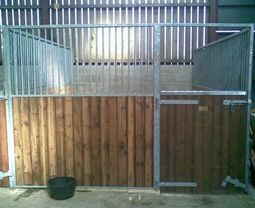 Any other size on request.